← Is it worth going to University? What do you want to be when you grow up? And what goes wrong afterwards. What do you want to be when you grow up? We have all been asked this question and we ask the same one to all little kids we meet. The answers can be wildly different; from doctor to actor, from lawyer to painter. It is a classic question. It is also a very smart one. It makes you think big-picture. It allows you to have a passion and purpose in life. This is a significant change. Instead of asking young people to think long-term, we indirectly force them to be short-sighted. Is the university an end in itself or is it the platform to an interesting career? Currently, the majority of students study a subject at university and only later they understand the job prospects and their fit with the area they have chosen. They are often disappointed. Identify what career they want to follow first. Then, choose a degree to make it happen. In this way, students will also have a clear understanding in their mind of ‘Why’ they study, not only of ‘What’ they study. It is a significant paradigm shift but a necessary one; especially during these challenging times of high unemployment and increased student debts. University is not an end in itself; it is the means to have meaningful careers and fulfilling lives. So let’s encourage the young people to think big and long-term. So, next time you meet teenagers, paraphrase the question that inspired all of us when we were kids. Ask them what they want to become. Encourage them to dream and get a plan to make it happen. This entry was posted in b4iapply to college, b4iapply to uni, Higher Education, Link education with career, What to study and tagged career, career options, link education with career, what do you want to be when you grow up, what to study, what to study at uni. Bookmark the permalink. 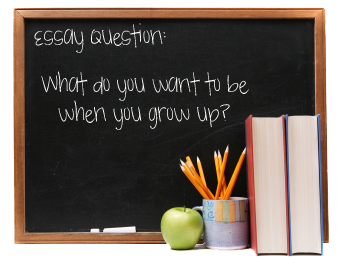 3 Responses to What do you want to be when you grow up? And what goes wrong afterwards. I really like this one Korina. …and congrats on your book – fantastic ! I have a wee worry about the idea of setting heihgr entrance requirements for university. And say this through personal experience. My daughter had aspirations to go to Uni but didnt do well enough at school gaining only 1 heihgr. She applied to college and was lucky enough to be given the chance to do an HND in Social Sciences. She has worked very hard over the last two years and has passed her HND with really very excellent grades. She applied this year to Uni for Sociology/History, Social Sciences and Social Work her ultimate aim is to be a social worker working in the rehabilitation of offenders (I know! Why? I have no idea! But this has been her dream for the last four years) Anyway she received offers from almost all the Universities she applied to and will take up a place at RGU in the autumn to train as a social worker.Now had university admission requirements been greater when she first left school it is unlikely that she would have been offered the HND place as more qualified’ people would have been offered those places as there would not have been places for them at uni. So instead of looking forward to uni this autumn she most likely would have had to do a social care course then the HND then Uni spending more time in full time education costing the govt and us more not less.Now she may be the exception (I dont think she is though) but I really think the point you made about students being at uni not through any great desire to be there is the more valid point. But reducing places and therefore curtailing the aspirations of many young people, like my daughter, who do not do well at school but who blossom when studying what actually pushes their buttons and genuinely interests them is not the way forward. Universities need to be more vigorous in assertaining why students want to study the subjects they are applying for. Yes there are arguments for where any cuts in places should be made.Another wee point is the way you dismiss ordinary, 2:2 and 3rd class honours these are still academic achievements and I know many people who gained these levels and are doing very well in their chosen careers. Academic ability is not always a good marker for how good at an actual job someone might be.Anyway just a few observations from someone who is a graduate of the Open University (I went college after school) and of Aberdeen University (as a mature student, travelling 100 miles everyday, juggling placements and family etc- but hey thats a whole other argument) with a 2:1 in Divinity which might have qualified’ me for my job but certainly didnt prepare me for it. Thanks Dolly for sharing your thoughts. I agree with you that when young people study what they are passionate about, they blossom. I believe though that the responsibility of finding what ‘actually pushes their buttons’ lies with the students themselves. Universities will not do it for them. Universities have their own priorities; they have a number of places per year to fill in order to keep going.